This edition: The holy trinity of hot dog condiments — Heinz Tomato Ketchup, Heinz Yellow Mustard and Heinz Sweet Relish, which are made from a total of 28 separate ingredients that we’ve broken down in the exact order they appear on their website. 1) Tomato Concentrate From Red Ripe Tomatoes: The bread-and-butter (well… tomato, I guess) of tomato ketchup. 2) Distilled Vinegar: Vinegar produced from the fermentation of distilled alcohol, this adds a slightly tart flavor. 3) High Fructose Corn Syrup: High fructose corn syrup is corn syrup that’s had some of its glucose converted to fructose enzymatically. It’s a commonly-used sweetener, and has been linked to obesity and diabetes by many, many studies. So, if possible, you want to avoid anything containing this ingredient. 4) Corn Syrup: Corn syrup is a liquid sweetener made of glucose. It doesn’t get as much negative publicity as high fructose corn syrup, but regular corn syrup also can be debilitating, considering it’s basically liquid sugar. 5) Salt: This is added for flavor. The term spice means any aromatic vegetable substance in the whole, broken or ground form, except for those substances which have been traditionally regarded as foods, such as onions, garlic and celery; whose significant function in food is seasoning rather than nutritional; that is true to name; and from which no portion of any volatile oil or other flavoring principle has been removed. 8) Natural Flavoring: Natural flavors are flavors derived from an actual food source — i.e., tomato flavoring taken from actual tomatoes. 1) Distilled White Vinegar: See above. 2) Mustard Seed: It probably goes without saying, but this is the basis of every mustard. 3) Water: You (hopefully) drink this one. 5) Turmeric: While this might add a little flavor, it more likely contributes to the bright yellow color of mustard. 6) Natural Flavor: See above. 1) Cucumbers: The basis of traditional pickle relish. 3) Cabbage: You know this one. 5) Salt: Again, this is added for flavor. 7) Aluminum Sulfate: Aluminum sulfate is primarily used in the purification of drinking water; however, it also can be used as a firming agent in foods and condiments, helping all of the ingredients gel together. Unfortunately, this is an ingredient to watch out for: “There is growing evidence for a link between [aluminum] and [alzheimer’s disease],” a 2011 study concludes. Not to mention, by consuming aluminum sulfate, you’re consuming aluminum. 8) Xanthan Gum: Similar to guar gum, xanthan gum is a thickening agent. It’s relatively harmless — that said, those with bowel issues should be wary when consuming it, as a study published in the British Journal of Nutrition found it to be a highly efficient laxative. 9) Potassium Sorbate and Sodium Benzoate: Potassium sorbate is a widely-used preservative that damages DNA when exposed to human blood cells, according to a 2010 study; however, long-term studies on the effects of regularly consuming this ingredient are required to provide a definitive answer on the matter. Another preservative, sodium benzoate has been shown to exacerbate hyperactive behavior in young children. 10) Dried Red Bell Peppers: You also know this one. 12) Polysorbate 80: Polysorbate 80 is often used to give sauces and condiments their saucy texture. Unfortunately, it promotes inflammatory bowel disease and a cluster of obesity-related diseases known as metabolic syndrome, according to a 2015 study. 13) FD&C Yellow №5 and FD&C Blue №1: Artificial colors like these are commonly considered to be dangerous. That said, as Shanahan also explained during our analysis of Doritos, studies arguing this are a bit flawed: “I’ve always been of the opinion that studies claiming artificial colors can cause cancer are irrelevant because [in the studies] they use really high amounts of the artificial colors — like, a million times more than you’d ever get [in your] food [throughout your lifetime].” All in all, the average person’s liver should be able to break down whatever minuscule amount of artificial coloring we consume with food. 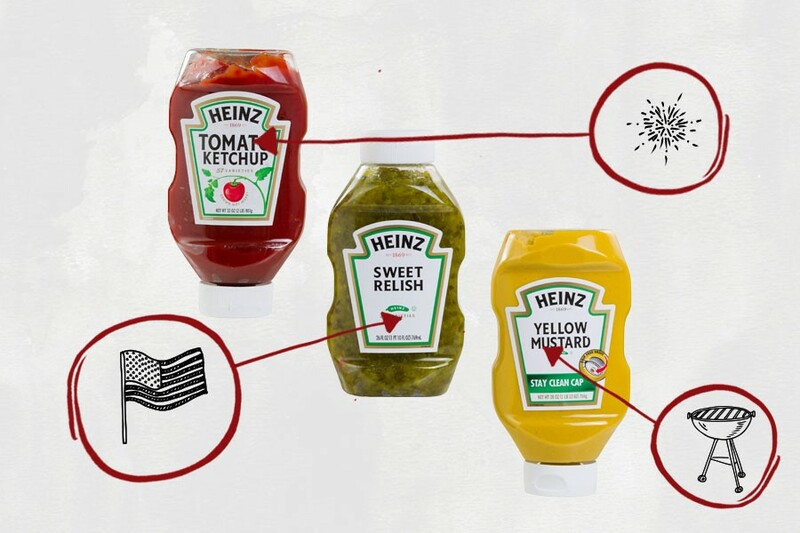 Of these three condiments, Heinz Sweet Relish contains the most conspicuously unhealthy ingredients (aluminum sulfate, potassium sorbate, sodium benzoate and polysorbate 80). Heinz Tomato Ketchup also contains high fructose corn syrup and regular corn syrup, both of which are far from healthy. That said, smears of ketchup, mustard and relish should be the least of your worries while noshing on preservative-filled sausages and burgers made from the meat/offal of as many as 100 different cows this Fourth of July.